Contains: Oats, Gluten, Almonds, Pecans and Sesame Seeds. 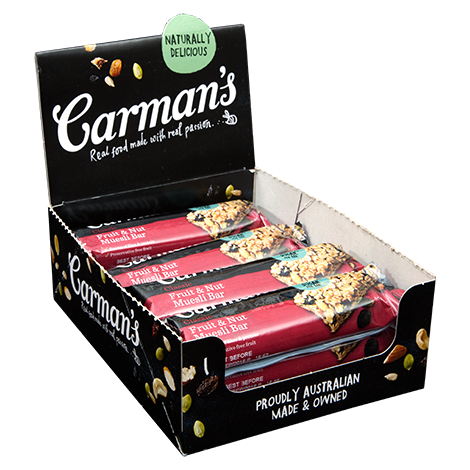 Carman’s Muesli Blend 77% (Whole Grain Oats 52%, Fruit 14% [Sultanas, Currants, Raisins, Coconut 1.5%], Sunflower Oil, Nuts 7% [Almonds, Pecans], Seeds 7% [Sunflower Seeds, Sesame Seeds, Pepitas], Golden Syrup, Oat Flour, Cinnamon), Glucose, Natural Vanilla Flavour. Big 55g bars for breakfast time, afternoon tea time - anytime!